Mark Higgins will attempt to beat his own record for the fastest lap of the Isle of Man TT course in a car at this summer's event, organisers have said. The Manx rally driver set the current record in 2011, lapping the 37.75-mile (60.7km) course at an average speed of 115.36 mph in a Subaru WRX STI. This year Higgins will return to drive Subaru's 2015 WRX STI. Higgins described setting his 2011 record as "totally exhilarating" and one of the "highlights of my career". The three-time British Rally champion said: "As a Manxman I love the TT and I have a huge amount of respect for the TT riders and what they do. "It will be a real honour to attempt a new fastest car lap." In his previous attempt on the course, Higgins created one of the most memorable race videos when he had a self-described "moment" at the bottom of Bray Hill at 150 MPH. The video has received almost 10 million views via various media outlets. The car he will drive is a stock US specification 2015 WRX STI, with the exception of a roll-cage, race harness, fire suppression system and modified springs and dampers to handle the sustained high speeds of the course. 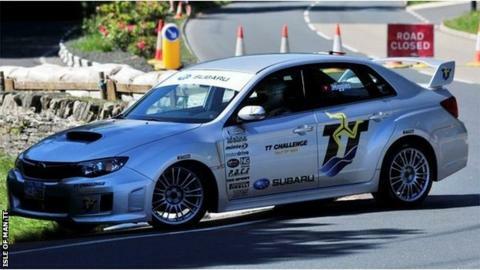 Subaru's Dominick Infante said: "We are very excited to return for another attempt of the TT course and to be the official car of the TT. "The Isle of Man is paradise for anyone who appreciates motorsport and there is nothing like the TT road course anywhere else in the world." Subaru will complete three timed runs under closed road conditions on Saturday, 31 May, Monday, 2 June and Wednesday, 4 June.